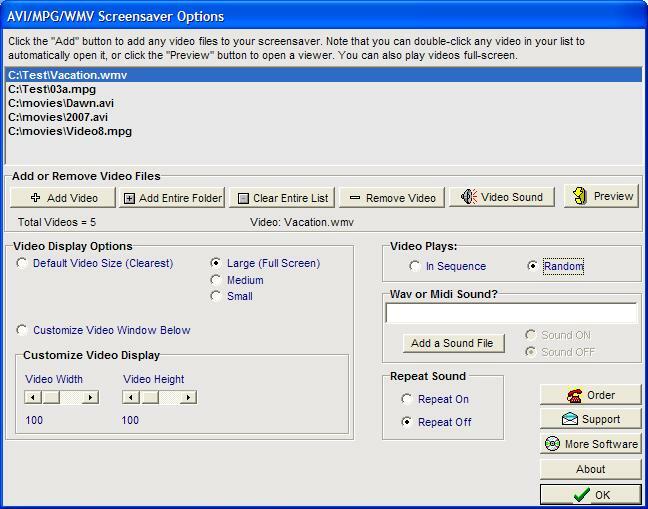 View your own MPEG, AVI, or WMV videos as a screensaver. You can play your videos randomly or in sequence, and you can adjust the size of the videos playing or stretch your videos full-screen if you wish. Video sound is also included, and you also have the option of turning off all video sound! Other options include previewing each video from the settings window, playing a midi or wav sound file, repeating the sound file, and password protection. ...... protection. You can also choose to play videos at their default video size for best video quality. Installation and uninstallation are included, and there are no additional run-time files needed. (Runs on ALL Windows systems). Avril Lavigne Screensaver brings beautiful Avril Lavigne into your desktop. The Jacques-Louis David Screensaver displays a collection of 45 images. Qweas is providing links to AVI/MPG/WMV Screensaver 3.23d as a courtesy, and makes no representations regarding AVI/MPG/WMV Screensaver or any other applications or any information related thereto. Any questions, complaints or claims regarding this application AVI/MPG/WMV Screensaver 3.23d must be directed to the appropriate software vendor. You may click the publisher link of AVI/MPG/WMV Screensaver on the top of this page to get more details about the vendor.